The best time to visit Myrtle Beach is June through August, perfect weather for splashing around in the Atlantic and lying on the beach! But, Myrtle Beach is truly beautiful year round and anytime is a great time to come stay on the Grand Strand. We have broken it down month by month so you can pick the best time to visit Myrtle Beach based on your vacation needs. June through August is Myrtle Beach’s peak season. If you love the sun and water this is the perfect time to head to Myrtle Beach. The average temperature is in the upper 80s to lower 90s with the chance of quick rain shower here and there. This is also the busiest time of year when it comes to tourist and you can expect an increase in occupancy everywhere you go! September through November the weather starts to cool down and is delightful for sunbathing and beach walks. The average temperatures are in the mid-70s and upper 60s during this time of year. Fall is typically the tail end of hurricane season and you can expect to see a decrease in crowds and great hotel rates and packages. 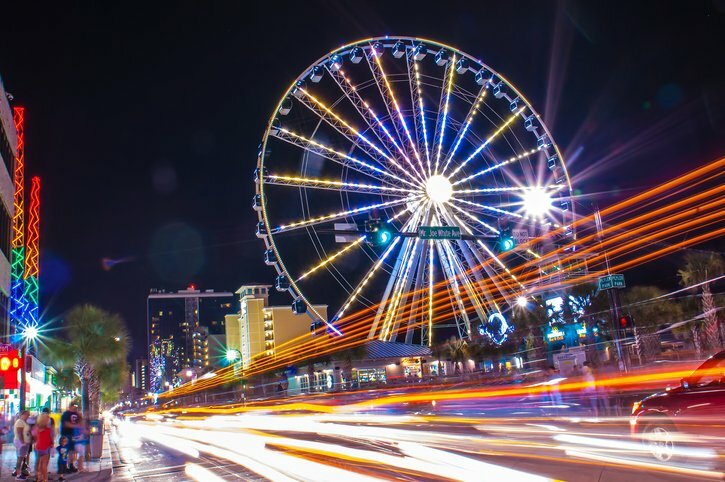 The winter months, December through February, are a great time to visit Myrtle Beach. Temperatures are in the lower 60s with low humidity and virtually zero crowds. While some restaurants and attraction may be closed or have off-season hours, there is still plenty to do in the Grand Strand. There are a plethora of shows, Thanksgiving specials, and Christmas events! March through May is the start of tourist season here in Myrtle Beach. Restaurants and attractions start to extend their hours and hotels begin to fill. The weather during this time of year is perfect, typically in the mid-70s and lower 80s. While the water may not be ideal temperature to catch waves, the beach is great for lounging in a beach chair and soaking in the sun!